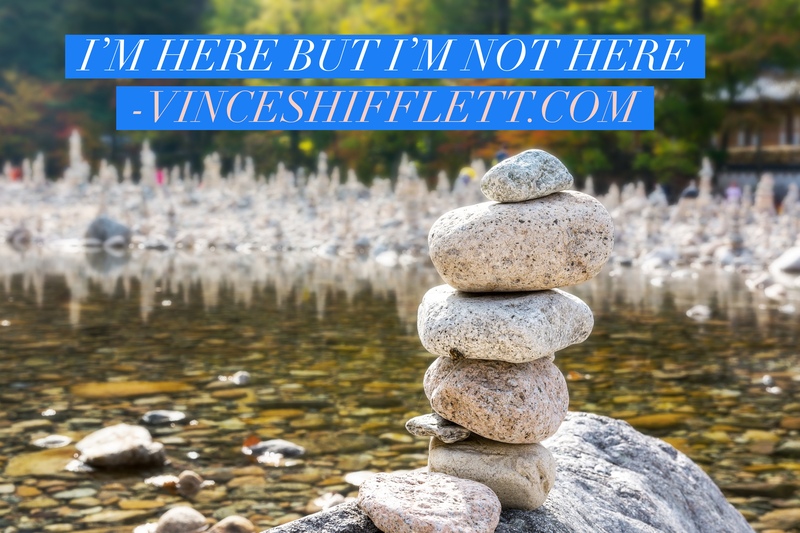 Ever feel like you’re here but you’re not here? I guess another way to put it would be to say your mind and heart feel disconnected. Many spiritual gurus have written about the importance of being in the now but what exactly does that mean? When one says they are here or present, are they talking about present physically, spiritually, mentally or all of the above? Lately I have been feeling so many times like I am here but I am really not here. It seems my mind and even my heart are elsewhere. In other words, I wander as I wonder. Consequently, it’s almost as if I go through the motions physically but am completely not present spiritually or mentally. The alarm goes off, I get up, go through my morning ritual, and head to work. All while spirit is tugging at me to go a different way. I continue on going through the motions and end up at work. Knowing somewhere deep in my spirit that God has a much bigger plan for me. What am I missing by not being here? As a result of being here but not really being here, I am quite sure I have missed out on some of the beauty right in front of me in the here and now. From that perspective, I completely understand the importance of being in the present. But what about the strong current that is pulling me elsewhere and distracting me from the present? What is that? I am feeling the urge to pay attention to that. It won’t go away. I feel it is spirit leading me but I struggle to follow. I instead get too much in my mind with the what ifs. I get too much in my mind with the doubt, fear, and questions. It all boils down to a bit of a war between the heart and mind. This implies that the secret to truly being where you are, is getting the heart and mind to align with one another and become one. So how does one accomplish this? Positive Affirmations: Allow your mind to hear you speak the words of your heart (spirit). Speak it regularly. Vision Boards: Allow your eyes to see daily what your heart and spirit are telling you. Alignment with people who support your path: Allowing others to be a positive influence encouraging you to align your mind with your heart. It is about energy. We are all energy. Everything is energy. However, not all energy is good energy. Don’t allow those negative thoughts or any negative talk to invade your energy space and cause an electrical shortage between your heart and mind. Surround yourself with positivity. Take steps toward getting out of the boat: Just putting one foot out of the boat is a step forward. It is a step in aligning your mind with your heart. The more steps you take, the more confident you become and before you know it you’ll be swimming toward your vision. Your mind will move closer and closer to your heart with each step forward. So, when does one step out of the boat into the water? Get soaking wet. Even if your head goes under the water occasionally, and it will, just move your arms and legs more swiftly to get back to the top. You will not drown. Why the war? Give in. Get out of the boat. Get out of your head and follow your heart. The heart (Spirit) will not lead you astray. Easier said than done at times I know. It is my intention to have the courage, bravery, and faith to step out of the boat. Let the wind blow across my face as I surf the waves on the way toward my vision. Are you going to work but really not at work? Are you in a relationship but really not in it? Once the mind fully believes what the heart feels, it shall be. Align your mind with your heart (Spirit) and march forward with your heart smiling all the way. Aligning the heart with the mind is really the only way to be where you are. Then one can say, I’m here. I am really present. And I’m loving every minute of it. Vince is a Critical Care Registered Nurse, Published Writer, and Columnist living and loving in Atlanta, Georgia. Enter your email address to receive his weekly educational, inspirational, and thought provoking work straight to your inbox. You can also follow him on Facebook, Instagram, LinkedIn and Twitter. Your support and feedback are deeply appreciated. Thanks, Vincent for you insightful and inspiration blog. I too feel like I am here but not here. It’s always good for me to take time out for myself to reflect and surround myself with positive people to help me feel in the present. Really appreciate the feedback. I think most of us have felt this way at some point in our lives. Thanks, Vincent for you insightful and inspiration blog. I too feel like I am here but not here. It’s always good for me to surround myself with positive people to help me feel in the present. Fascinating and very interesting topic, Vince. One point. When my mother passed away some 11 years ago, part of me died with her. Until now I miss her dearly and often feel that that I too am here but not here. Does grief play a part in this and is it really possible to be grieving 11 years on ? My Mom has been gone 7 years. Hard to believe. There are days I still allow myself to grieve her loss. There is no right or wrong time to stop grieving. I do think grief can play a role in feeling like we are here but really not here. Loss leaves a void. An emptiness. The feeling of being here but not being here can also be a feeling of void. Love that you bring this point out. Definitely something to think about. As always, thanks for sharing. Thank you so much. Really appreciate your kindness and support as spirit leads and inspires me to continue sharing.